If you enjoy medieval warfare simulators, Mount and Blade 2: Bannerlord might be right up your alley. Taleworlds Entertainment’s newest entry in the series had a pretty exciting demo during my appointment with them at E3 that had an army laying siege to an enemy castle. I had the luck of sitting right next a member of the apparent very popular Mount and Blade‘s modding community, so the amount of info that went right over my head was vast, but at the same time, I got to see a lot of interesting and easy to grasp aspects of the new version. According to them, the original Mount and Blade was very raw, so the aim with Bannerlord was to add improvements to the overall presentation to the game without changing the gameplay too much, which is one of the franchise’s biggest pros. The presentation cons, though, were numerous in the previous game. 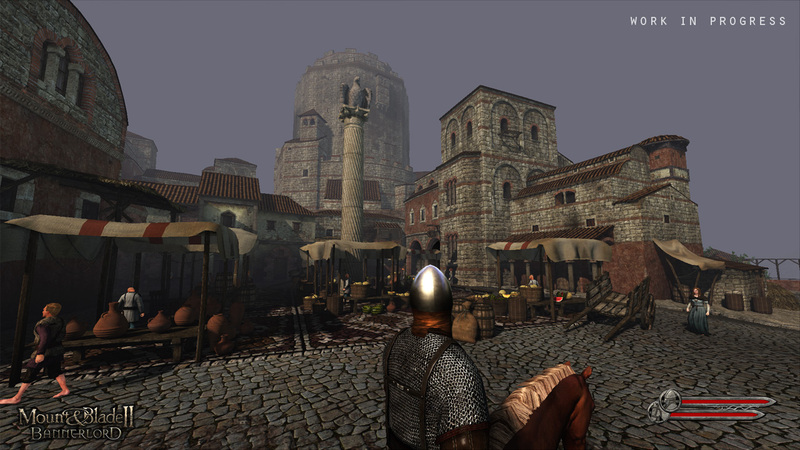 Animations like climbing ladders and soldiers reacting to damage were crude and not detailed in the original, which have made their way into Mount and Blade 2. As the demo showed, once the castle was breached and a sword fight took place, both sides were simply going nuts, with the blue side turning so red in the red clothed side’s blood that at one point I was sure they’d start attacking each other in confusion. Once the fighting died down, the keep’s lady declared her defeat and handed over control to our bannerlord. Controlling the invading army looked to be quite involved. The person playing the demo showed the breadth of options at our disposal when issuing commands, but didn’t shy away from taking matters into his own hands by directly controlling some of the siege weapons. Once a spot in the wall got weakened enough, he laid ladders and thus the aforementioned carnage began as the many warriors on both sides took to melee, in which he himself took part in, bloody sword in hand. I little experience playing Mount and Blade, but from the few minutes that were shown of the new game, for as early as it is in development at this point, it’s looking quite epic, but also extremely chaotic, which is par for the course if you consider what went on during an actual siege. Taleworlds didn’t announce a release date for this new game, so keep an eye out for further developments in the near future. For now, check out this siege gameplay video straight from Taleworlds Entertainment.